Problem: A week ago today, our laundry system was not working. At all. We had dirty clothes piled up in every single room, and often on the floor in the hallway and all over the laundry room. My daughter would go through and sort the clothes in the laundry room and hallway once a day, and we washed clothes three to four times per day. Half the time, she wouldn’t have all of the laundry and inevitably the culprit would complain because their favorite xxxx wasn’t getting washed. Then the clean clothes would pile up on the counters of the small laundry room until the weekend when I would finally fold whatever remained and put it away. We live in a 1600 square foot home, and 250 square feet of that is this hallway. We don’t have room to spread laundry all over the house! My husband finally decided that this was a problem he could fix. We talked about it and decided on six categories for laundry. These would be brights (reds, purples, pinks, etc. ), darks (navy, brown, black etc. ), neutrals (grays, whites, tans, etc. ), jeans (all jeans and heavy pants), towels, and miscellaneous. He left the house early on a Saturday morning and headed to the closest discount store. He came home with six hamper baskets, and a package of sheet protectors. Each basket needed a clear label, so we took some pictures for each category of clothing and my husband made signs for each basket. 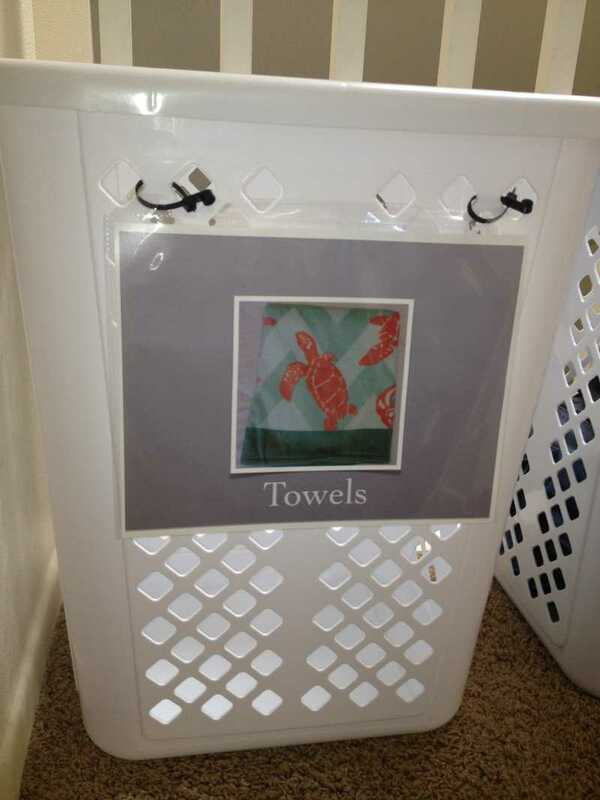 We slipped each sign into a sheet protector, and my husband used these plastic zip-ties he had in the garage to attach the sheet protector to the laundry basket. 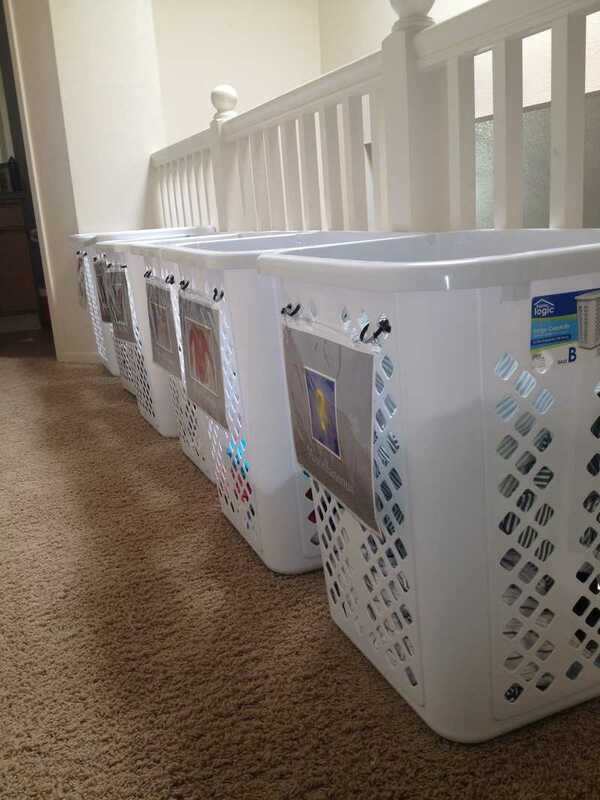 Now when the kids take off their clothes at night or put on clean clothes in the morning we have them sort their clothes into the laundry baskets right away. 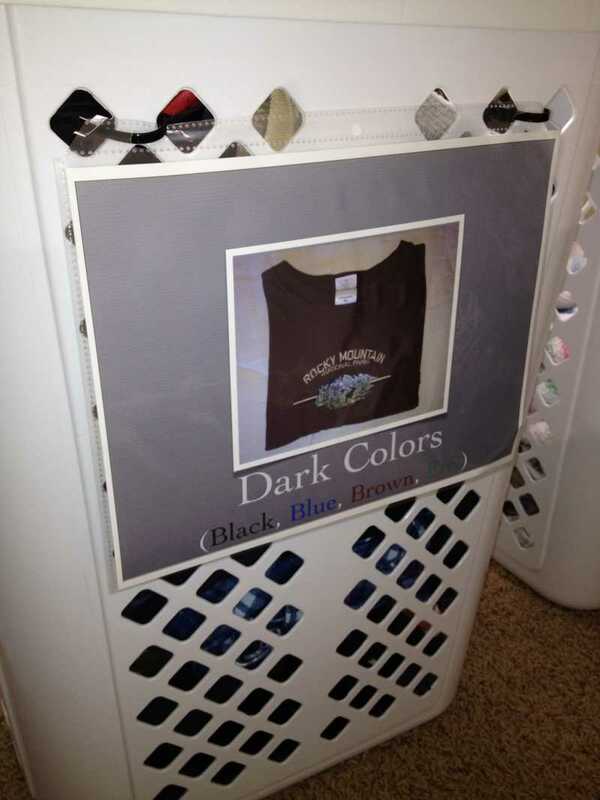 Even my three-year-olds can read the signs and sort laundry. 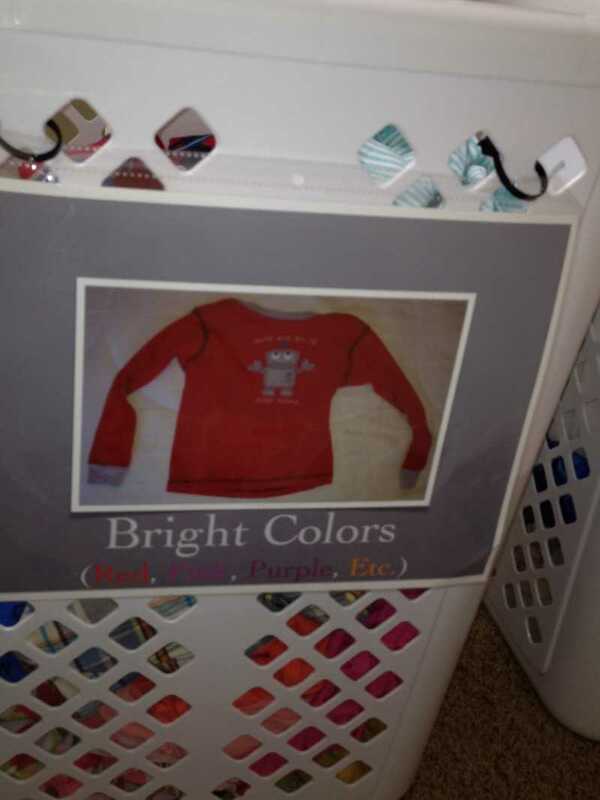 At first, they did try to put all of their pajamas in the sign with a red pajama top, but we were able to quickly explain what that picture meant. Whenever it is time to switch laundry over (still three to four times per day) we just find a full laundry hamper and make the switch. Something is always sorted and ready for us to wash.
Wow! That is a great idea! Congratulations to your hubby for a great solution. Love the blog. We have a small house too, very small. This is something I’ve been wanting to do but have no space (think 1100sft) so my dh purchased one of those multi hampers for the kids. It’s not as good as separate hampers because they are much smaller but it sort of works. I understand that Linda! We have 1600 square feet, six kids like you, and 400 square feet is that stupid long hallway. The layout of this house does not maximize 1600 sq ft. But, we make it work. For this move, we prayed that the children and I would have a strong community of support and God has answered that prayer in spades. We are grateful. This is fantastic! I’ve been wanting to do something similar at my house for a while, but it just keeps getting pushed to the side. I don’t have as much laundry as you do (only 4 kids), but I need something to organize better. Thanks for the motivation!!! What a cool system!! It even looks nice! What a great laundry system! We also have 6 kids and laundry can be a mess some weeks. I may have to go tackle our laundry room now, thanks for the motivation! Hope you have a great week! Looks like a great system! I know laundry in our family of 10 is always an issue. Love when we have a system that works! 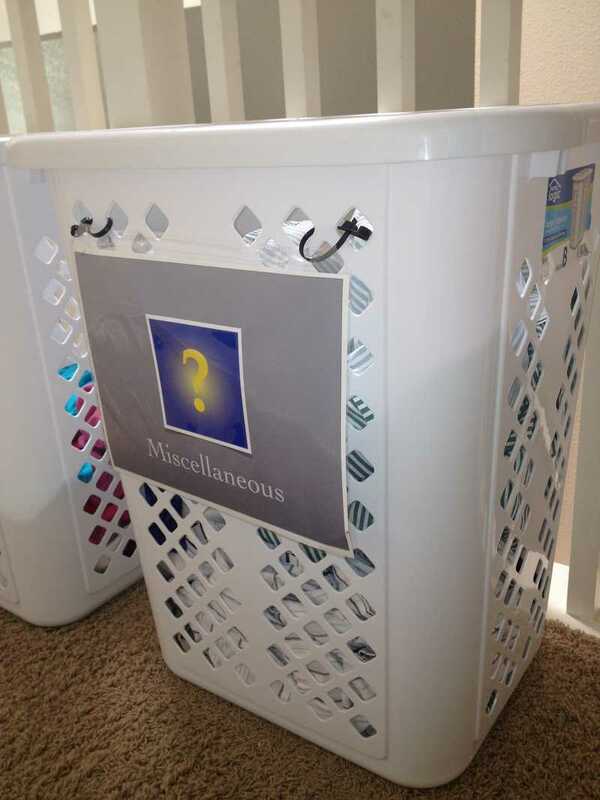 We have used a similar system using collapsible (tall dorm room) laundry baskets in each person’s closet. They fit easily under the hanging clothes. White basket is for white clothes, navy or black basket is for darks, and the red or yellow or other bright color is for the brights. My girls are of the age when they can be responsible for doing their own clothes….when they have enough for a load, it’s sorted and ready to wash. Sometimes they even work together combining their partial loads to get that favorite shirt washed. They are also responsible for moving the clothes to the dryer or hanging to dry (we have put extension shower rods in several doorways. That way they put the shirt or pants on a hanger and hang it up. Putting it away is then a matter of moving the dry clothes to their closets. Absolutely brilliant! I also loved that your hubby did this for the family. BTW, I live in SoCal, too. I saw your post on soyoucallyourselfahomeschooler.com and thought I’d say hi. I have a post on soyoucallyourselfahomeschooler.com ?? I don’t remember guest posting for that sight. Hmmm. I had done something like this at my house with limited ongoing success. I did funny signs for each category like Darth Vader for “The Dark Side” and a funny picture of a dog being washed for whites. The family got a kick out of them, and I also do several categories. We just couldn’t always spare the space with my son’s wheelchair, but when we could the sorting always required a re-sort. I had teens. Maybe that was the issue. I wish I had room for this but I love the idea. I may be able to swing a variation of this soon! Great ideas! What an AWESOME idea! I have 4 children, 13, 10, 3 & 2 years old. (most days its more like 3, 3, 3 & 3 years old lol) I had tried to set up a basket in front of the washing machine and told them to put their dirty clothes in the ONE basket. I mean, how difficult is that to do? Not at all, however thats where the laziness kicks in…… NOTHING ever made it into that basket. It’s just easier to spread all over the floor for Mom to pick up! WELL…..We are moving into our new house next weekend and there will be new rules set in place. I am SO glad I found this, what an excellent idea! I think it will be fun for them to do, and fun for the big kids to teach the littles the right way to help mom out big time! Heres to hoping this solution works out! I have faith! LOL! Thank you so much for sharing and I can’t wait to start in our new home with new organizatinal skills! Wow now i need to try this, we have 2 kids 17 and 3 and my DH and me. But we live out in the country on a well so we do laundry morning and night. Plus i have a home daycare. I wish i could do 4 loads a day. We had a water leak and stoped washing for a bit and now i have a mountain. With hormonal teen and a fashionista daughter i feel like i will do laundry for months before this. Now i think i will try this our bathroom is huge 14 x 15 but not well organized and woth a tub that could be my coffin.